Minute of silence held around the country as unique commemoration of Jewish heroes who saved their brethren gets underway outside Jerusalem. Israelis throughout the country stood for a minute's silence Thursday morning, as the sirens sounded in honor of Holocaust Martyrs' and Heroes' Remembrance Day. In familiar yearly scenes, motorists could be seen parking their cars in the middle of highways across Israel, standing together with pedestrians in a powerful show of national unity and remembrance. Holocaust Remembrance Day - known as Yom HaShoah in Hebrew - began Wednesday evening, at the start of the Hebrew calendar day, with a powerful ceremony at the Yad Vashem Holocaust Memorial Museum in Jerusalem. Among the dozens of commemorative events taking place today was a unique ceremony at the Martyr's Forest on the outskirts of the capital, held jointly by the B’nai B’rith World Center in Jerusalem and Keren Kayemeth LeIsrael (KKL-JNF). The event - held now for the 13th consecutive year - is the only one dedicated exclusively to commemorating the heroism of Jews who rescued fellow Jews during the years of torment in Europe. Some 200 Border Patrol Cadets – who will provide an honor guard - and 200 high school students are participating in the ceremony together with Jewish rescuers and survivors. This years' event memorializes Rabbi Moshe Shimon Pessach (1869-1955), an outstanding rabbinic and communal figure who served for 63 years as rabbi, and later Chief Rabbi, of Volos, Greece. Rabbi Pessach – the scion of a long line of towering Sephardic rabbinic figures in Greece – shepherded the Volos Jews community of approximately 1,000 souls, through tumultuous times. Fiercely loyal to his country and to his community, Rabbi Pessach initiated and orchestrated the rescue of his community during the German occupation with the assistance of the Bishop of Volos Joachim Alexopoulos and other non-Jews - efforts that led to the survival of 74% of the Volos Jews. This was an extraordinary achievement in a country where 85% of the Jews were murdered in the Holocaust. In addition to these efforts, Rabbi Pessach also took up arms against the Nazis, and led a partisan unit against the German army. On Rosh Hashana 5703, 30 September 1943, Rabbi Pessach was summoned to the headquarters of the German military governor Kurt Rikert, who demanded that he submit within 24 hours a list of all the Jews in the city and their assets, purportedly for the innocent purpose of determining the amount of food rations needed to sustain them. The astute rabbi had no intention of playing into the hands of the Germans and instead embarked on a series of actions to rescue his community, at great risk to himself and his family. After feigning relief that the list was needed only for statistical purposes and extracting a three-day extension for submitting the list, Rabbi Pessach went to his friend, Archbishop Joachim Alexopoulos, Metropolitan of Demetrias and Bishop of Volos, to ask for his intervention to find out the Germans' intentions. The Archbishop contacted the German consul in Volos, Helmut Sheffel with whom he as on singularly good terms, and was told by Sheffel in no uncertain terms that the Jews must leave Volos before the stated deadline. Archbishop Alexopoulos – who died in 1959 and was recognized in 1977 by Yad Vashem as a Righteous Among the Gentiles at the initiative of the Jewish community of Volos - informed the rabbi of Sheffel's warning and handed Rabbi Pessach a letter of introduction addressed to the clergymen in villages surrounding Volos, urging them to protect the Jews in every way. Through the Rabbi's intervention, and with the help of the mayor, municipal officials and the chief of police, the Greek underground spirited all but 130 Jews (who were later arrested, deported and murdered) – including Rabbi Pessach and his family into hiding in the surrounding remote mountain villages over a three day period. The decision to evacuate the community was not an easy one for the Rabbi, considering the difficult conditions and encroaching winter in the mountains, but it was a decision he was determined to implement. The Rabbi's escape gave the signal for the rest of the community to go into hiding and they were all accommodated in the villages. The Germans put a bounty on his head, two of his sons who taught Jewish studies in Salonika and Didymóteicho were captured by the Germans and murdered, and his wife died while they were in hiding. Rabbi Pessach established a unit of partisans that rescued allied soldiers and fought the Germans – actions for which he was decorated both by King Paul and by the commander of the Allied forces in the Mediterranean. 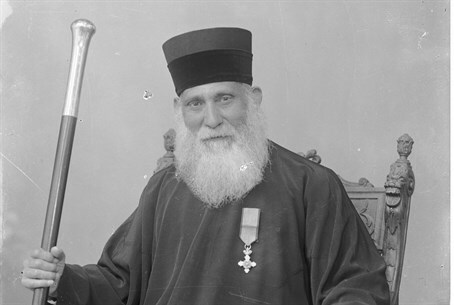 After the war, Rabbi Pessach returned with 700 members of the community to Volos, and engaged in efforts to rebuild the devastated city. In 1946 he was elected Chief Rabbinic Count Judge and Chief Rabbi of Greece, titles he held until his death. In April 1955, Volos was hit by a devastating earthquake. The aged rabbi was forced to live in a tent, later forfeiting his house in order to build there a new synagogue, but he died shortly after, on November 13. In recognition of his contribution to Greek Jewry, Rabbi Pessach and his wife Sara were reinterred in 1957 in Jerusalem besides Chief Rabbi Ben Zion Uziel and his extensive library was brought to Israel and is archived as a separate unit at the Ben Zvi Institute. Yaacov (Jacko) Razon, a Greek-Jewish boxer who helped other Jews survive at the Auschwitz,Buna and Buchenwald concentration camps. Since the establishment of the Jewish Rescuers Citation in 2011, 100 awards have been presented to rescuers who operated in France, Germany, Holland and Hungary.